--- Choose Colour --- Aubergine and Amethyst Steamed Velvet Forest and Black Steamed Velvet Midnight and Black Steamed Velvet Claret and Black Steamed Velvet All Black Steamed Velvet Black and Forest Steamed Velvet Black and Amethyst Steamed Velvet Black and Claret Steamed Velvet Black and Midnight Steamed Velvet Black and Aubergine Steamed Velvet Other Combination? Email us! Allow us to present the beautiful Guinevere Gown! 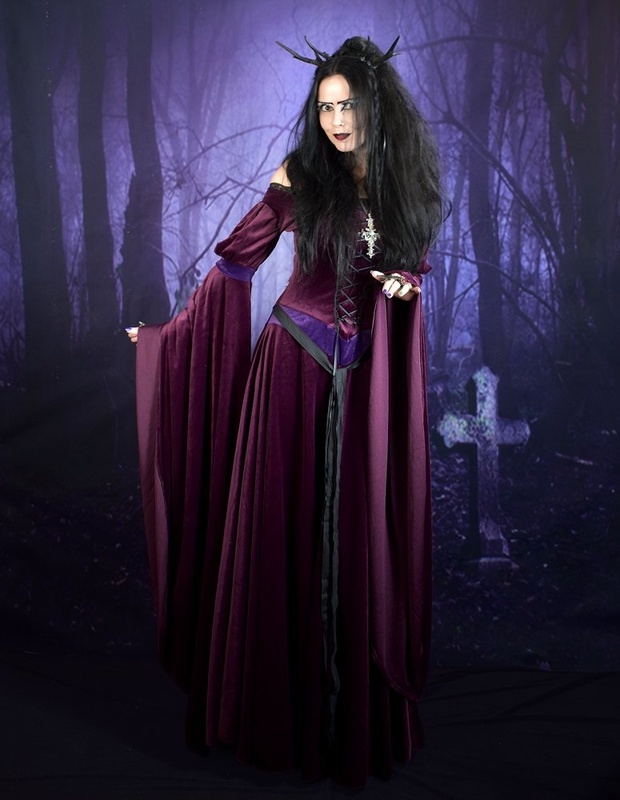 A classic medieval gown made from our gorgeous Steamed velvet, shown here in Aubergine and Amethyst. It’s off-shoulder, with a lace trim along the neckline; the bodice is detailed with laced braided looping, and a contrast panel at the waist. The upper sleeves are gathered into another contrast band, which ends in an epically Authurian cuff. The skirt is bias-cut, then bias-cut some more for good measure , to ensure maximum swishage! :D There's also a biased-binding belt to complete the look.